A local production at RVTV. Over the years (founded in 1989), the mission of RVTV has not changed significantly, but the technology has. With only 3 full-time staff, a handful of professionals and an army of students, RVTV charges forward as the cable access station for the Rogue Valley with 45,000 subscribers. RVTV is housed on the SOU campus in the Digital Media Center (a separate entity offering for-hire production services) and currently has four channels: Prime, Civic, Voices and Grants Pass. They call them by name rather than call number because Charter Spectrum moved channels not long ago. This was an unfortunate move explains Givens: “It hurt to bump us way out to the 180s.” But bumped does not mean forgotten. The Prime channel (180 on Charter or 9 on Ashland Cable) is where RVTV all started in the early 90s with the city of Ashland programming and is the home for City of Ashland Council and Parks meetings, SOU content, and more. For strictly Jackson County and Medford government content, viewers tune in to the Civic channel (181 or 14). RVTV Grants Pass channel (183 or 21) is carried in Josephine County only and focuses on local issues and content. Yet, the fourth and most unique channel is Voices (182 or 15) which is citizen-produced content, neither created nor dictated by RVTV, covering Jackson and Josephine counties. Community members take certification classes consisting of five separate workshops to create their own inspired content. There are shows like: Cooking with Kumud, Ramping Up Your English, Artist on Your Doorstep, and Gems of the Rogue Valley, which can be viewed at the RVTV section of archive.org. And, with such vast and varied content, one might never turn on the TV again and still find plenty to watch. For those who feel inspired to create and deliver shows locally, the next certification class begins on February 7 at 6 pm. Community members can learn basic production and the technology, book time in the studio or use the digital commons for a nominal fee. The certification culminates in a live show on March 7. But who’s watching RVTV these days and with television changing as a media form, what can community members expect from community television? Givens thinks that with streaming and content everywhere, RVTV must reinvent itself. “The media industry has changed a great deal,” says Givens. “I remember cable access shows here as a college student in the 90s. It was the only way to share your content publicly.” But not anymore. 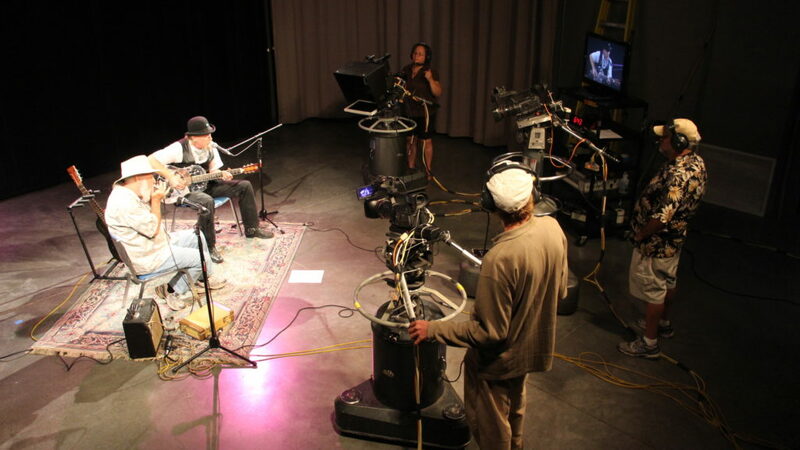 Although the future of cable TV in general is fuzzy, in the interim, community members can learn about certification and education opportunities at DMC.sou.edu or livestream RVTV shows at RVTV.sou.edu. Caption: A local production at RVTV.